Megalodon was nothing to mess with. The prehistoric shark grew up to 60 feet long and weighed between 65 - 100 tons. Though the monster shark has been extinct for nearly 2 million years, Megalodon is enjoying a moment of unprecedented popularity thanks to the Discovery Channel's ratings success in last year's "Shark Week" special "Megalodon: The Monster Shark Lives." The sequel, "Megalodon: The New Evidence," will air Friday night as the culmination of this year's Shark Week, which starts tonight. But some experts worry that Megalodon mania and Discovery's annual sharkstravaganza, now in its 26th year on TV, is blurring the line between education and fear-mongering. A reconstructed skeleton of a Megalodon. Fossil remains suggest the prehistoric shark was roughly 30 times the size of a modern great white shark. Credit: Calvert Marine Museum, Solomons, Maryland. "I have a complicated relationship with 'Shark Week,'" said David Shiffman, a marine biologist at the University of Miami. "'Shark Week' was a big part of the reason I became a marine biologist. But in recent years, there's been a real shift toward fear-mongering over education, and pseudoscience over science." Shiffman says Shark Week's focus on incredible survival stories of people who were bitten by sharks makes it seem like a common occurrence. But in 2013, 72 people worldwide were attacked by sharks, and only 10 of those attacks were fatal. Dogs, bees, cows, toasters, and vending machines kill more people each year than sharks do, Shiffman notes. "More people are bitten by other people in New York City alone than are bitten by sharks in the whole world," Shiffman said. "It's an extremely unlikely occurrence. The average American is almost a million times more likely to die from a heart attack than a shark attack, but you'd never know that from watching things like 'Shark Week.'" Humans are far more dangerous to sharks than sharks are to humans. According to National Geographic, for every human killed by a shark, approximately 2 million sharks are killed by humans. Sonja Fordham, the president and founder of Shark Advocates International in Washington, D.C., said she shares Shiffman's concerns about the focus on sharks as ruthless people-eating machines. "Obviously the threat that they pose to people is exaggerated," Fordham told Fusion. While "Shark Week" focuses more on flashy, popular types of sharks — the great white, whale sharks, hammerheads, tiger sharks — Fordham said conservation efforts need to be concentrated on the littler, lesser-known species. In the U.S., laws are in place to ban at-sea removal and even sale of the fins of big sharks in an effort to prevent "finning" (removing their fins for use in shark fin soup, a traditional Chinese dish), but smaller types of sharks, like the smooth and spiny dogfish, are often excepted, while many ray species are still unprotected and at-risk. "We need to spread the love to the smaller and flatter species," Fordham said. "Rays — which are flattened sharks, essentially — they're generally more threatened and less protected than sharks." Shark fins for sale at a market in Indonesia. Contrary to traditional beliefs, shark fins have no taste or nutritional value, and can even contain dangerous levels of mercury and other neurotoxins. Some fishers believe the fin will grow back if they release the shark back into the water, but that's not true. Either the shark will be eaten by other predators attracted to the blood, or it will starve because it can't swim after prey effectively. Credit: Getty Images. Fordham said the fins of smaller sharks such as the dogfish are less prized than ones from the "more charismatic" species, but as conservation efforts have targeted banning finning for big sharks, smooth and spiny dogfish have fallen through the cracks. 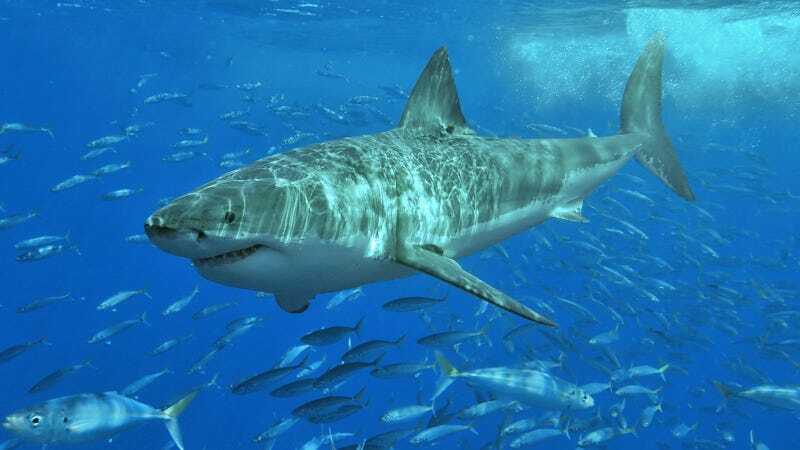 "The great white sharks aren't out of the woods, but they're among the most protected around the world," Fordham said. "There's a state proposal out now that could ban the removal of spiny dogfish fins. That's the best way to make sure that finning doesn't happen, is to keep fisherman from taking the fins off at sea." For their part, the Shark Week website says they're partnering with LUSH cosmetics to raise money to protect the roughly 100 million sharks killed annually for their fins. As for people who are still concerned about seeing a shark fin headed toward them in the water, we asked Shiffman for tips on how to avoid becoming part of a (very small) statistic. "You don't even really need to worry about it. It's an unbelievably unlikely occurrence," Shiffman said. "If you want to reduce your risk even further, stay with a group of people close to shore, away from river mouths and schools of fish flapping at the surface." Despite Shark Week's focus on infotainment, Fordham says a week of TV programming about sharks is a good opportunity for shark conservationists. "While many people have concerns about negative imagery and how it affects shark policy, the upside is that you have this overwhelming attention to sharks for a period of time. It's a veritable frenzy," Fordham said. "And with that there are myriad opportunities to channel that fascination into broader understanding of sharks and concrete conservation actions."